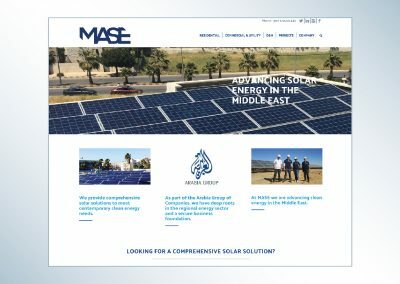 Working with Identity³, we helped MASE in Jordan to distinguish their firm in the competitive solar PV market in the Middle East with brand work articulated through their first website. The web site design was the first piece of MASE’s updated identity. Once the site was complete, they were able to roll conventions we established into other collateral pieces.